LSU standout linebacker Devin White of Springhill, La. 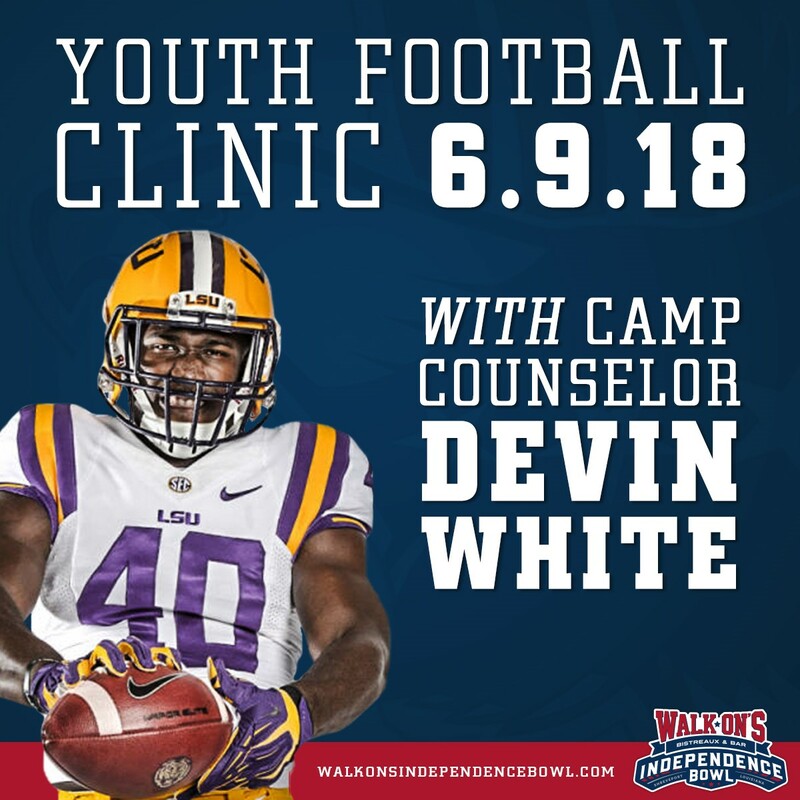 will serve as a camp counselor at the eighth-annual Walk-On’s Independence Bowl Youth Football Clinic on Saturday, June 9. White – who earned first-team all-SEC honors in 2017 after recording 133 total tackles – will also address the participants prior to the start of the clinic. White will join coaches from Grambling State, Sam Houston State, Northwestern State and Louisiana College offering instruction to the clinic participants. The clinic is open to all children from five years old up to incoming eighth grade students. It will be held at Independence Stadium in Shreveport and will run from 8 a.m. – 11:30 a.m. Registration will begin at 7 a.m. at the southwest entrance of Independence Stadium. Registration for the clinic is free, and can be submitted online by clicking here. Parents must register their children in advance of the clinic, and registration for the clinic will close at 400 participants. Clinic participants will learn football fundamentals by going through offensive, defensive and special teams drills. Participants will also be taught different fitness techniques and the importance of being physically active. Lunch and t-shirts will be provided free of charge at the conclusion of the clinic. Sponsors of the Youth Football Clinic include First Bossier, Raising Cane’s Chicken Fingers, Willis-Knighton Health System, D1 Shreveport, Little Works in Progress and Sports World.